My disclaimer for the next post: I’m the type of person who plans my vacation around meals. I like to get suggestions from friends and family who have lived or visited there, and if all else fails, I turn to Yelp or Twitter. There’s nothing I hate more than being forced into “just grabbing something” at the nearest open restaurant. It’s like giving up! If I could pack an extra stomach just for vacations, I truly would. I usually find myself armed with more recommendations than I’ll have time for. Such was the case with our trip to Hawaii Island. When we were in Kona, we were lucky enough to have our own personal chef, aka Kimi, to keep us fed and happy. In fact, I don’t think we ate a single meal out while we were in Kona. One of the recommendations I’d wanted to try on that side was the pork chops at Manago Hotel. Home-style goodness that will have to wait for another trip. 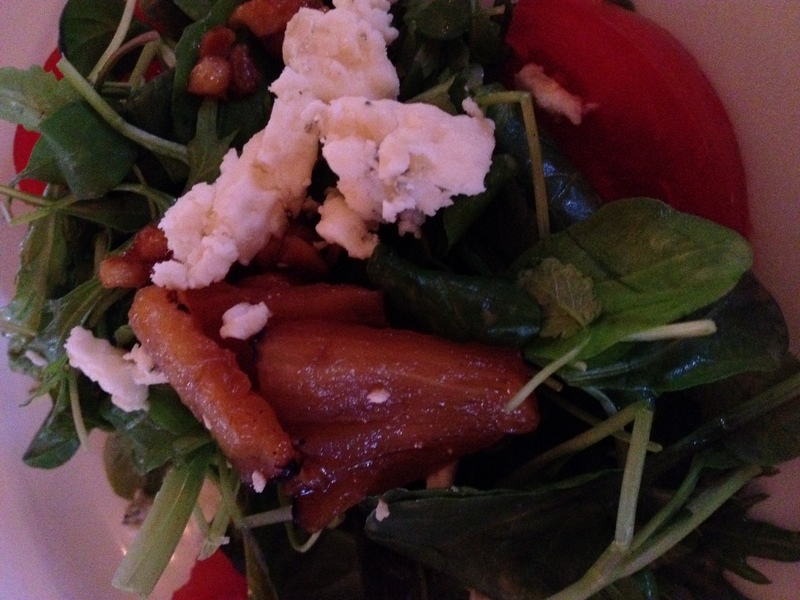 En route to Hilo, our first foodie pitstop was a dinner at Merriman’s in Waimea. I would love to go back to Waimea another trip when there’s more time – there’s the Hawaiian Vanilla Company nearby and my friend Lori is growing her own strawberries there! But this time we just had a quick stop for dinner, so we were lucky enough to get seated at Merriman’s without reservations. A coworker had recently visited Waimea and raved about the menu at Merriman’s, so I knew I had to try to squeeze in a stop. 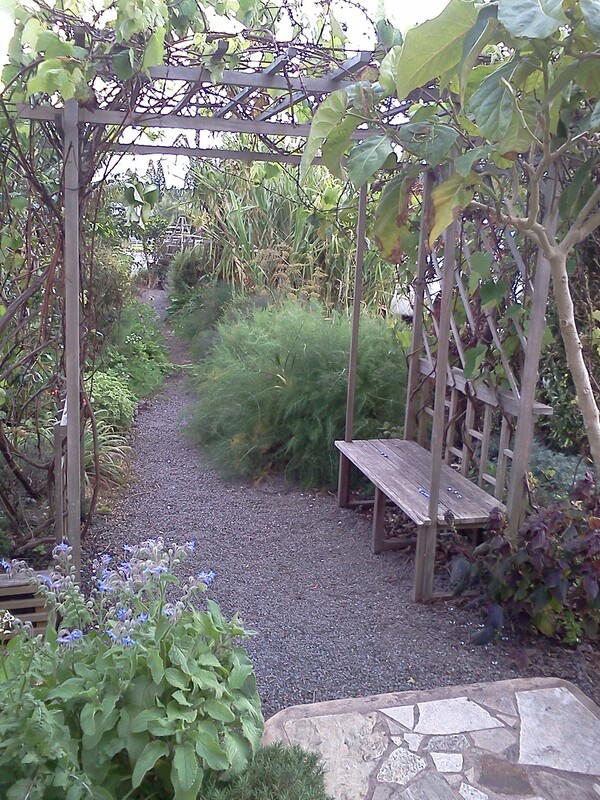 I loved the garden outside Merriman's - everything was landscaped with herbs, vegetables, and edible plants. Gorgeous! Peter Merriman was the founding president of the Hawaii Regional Cuisine chefs. His commitment to local ingredients and fresh presentations is evident as soon as you enter the restaurant. I loved the edible landscape of the garden outside, the planter boxes with herbs on the entry to the dining room, and the interesting selections on both the cocktail and dinner menus. Interesting (and delicious) cocktails. 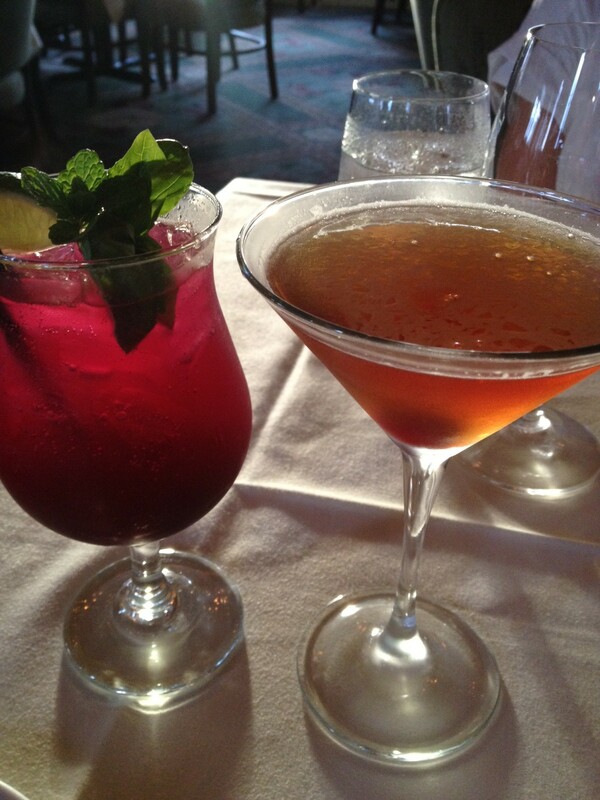 The one on the left is called "Mobeeto" because it's a mojito-like drink flavored and colored with beets! We decided on our own “tasting” menu, sampling delicious appetizers like the kalua pig quesadilla, a smoky house cured bacon, and a crispy big island goat cheese. For the entrees, the standout was a pan seared diver scallop served with tarragon creamed corn. I washed everything down with a cocktail called She’s So Manhattan, which gave an herbal twist to the traditional cocktail with a shiso leaf infusion. Close up of the sassy green salad with vanilla poached pineapple, tamari glazed macadamia nuts and big island goat cheese. Although the dessert menu looked delicious, we opted to skip it since we still had about an hour’s drive to Hilo. On the way we stopped at Tex Drive In in Honokaa for their famous malasadas. 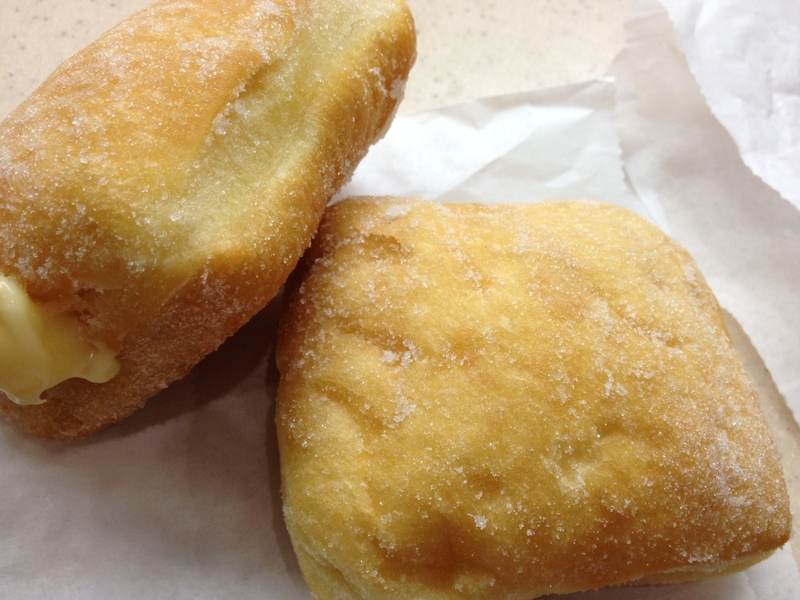 Many people have told me that they prefer Tex’s malasadas to Leonard’s but I think I’m still a Leonard’s girl. These malasadas were square shaped and slightly less doughy than Leonard’s. There were interesting filling options as well, but I tried just the “classic” rolled in sugar, which was a perfect sweet bite to end the day as we drove into Hilo. I am so happy you started this blog! Now I just have to plan my next trip back to O’ahu and then a side trip to the Big Island!